A menu of social runs of various distance and speed are offered, which are followed by hot showers and a drink and food in the club bar. We meet at 6.45 for a 7 pm start.We also hold training runs on Monday nights and at weekends we meet up for parkruns or other runs which are a mix of competition runs and social romps through woods and fields. We also hold social events with dances, dinners and trips abroad and in the UK. Many of our members also meet up for cycling and to compete in triathlons. We compete in races throughout the year, ranging from 5K up to marathon distance as well as team relay events. We have various club competitions. 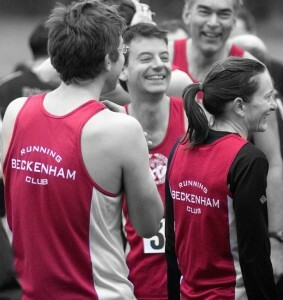 Once a month we all run the 3.5 mile Handicap race on a circuit of Beckenham Place Park. It is challenging but great fun with a trophy awarded to the person with the most points at the end of the year. Similarly, we have a Grand Prix competition with one race per month, in and around London, again with prizes for those with the highest scores at the end of the year. We also host an annual relay and a charity trail race, please see the Our Races section for further details. This level of membership gives full use of the extensive facilities at Beckenham Sports Club on club nights (Wednesdays) only, including access to changing rooms, showers, and licensed bar offering hot meals. Please note that there are no additional on-the-night subscription charges to pay and you are welcome to train with us at other times when we meet at other locations. 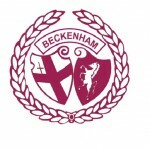 If you become an affiliated member then you we will register you with England Athletics so you can represent Beckenham at races. 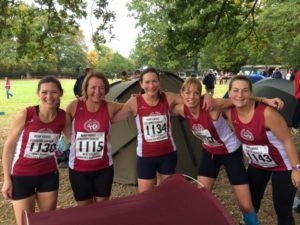 This covers both social membership of Beckenham Sports Club and Running Club membership, you can take advantage of the club’s facilities for meals or drinks 7 days a week and not just on club nights. If you are already a member of another section within the club then your membership cost is £20 to cover England Athletics affiliation. If you want to try us out you can just turn up on a Wednesday evening for a run and we will look after you. If you aren’t sure if you are yet fit enough click here.